honor requests for compensation, hey, that’s fair and reasonable. data area, and then re-scanned to get an updated one. Once I had that, I sent it everywhere it was needed… Sheesh !!! Regarding the FinPro freeze, I had to do the following: Go to File>Open an Account, Click Scan then close the window once it completes. Network should be reconnected once you re-login to your trading account. same ports and address, but perhaps not ?.. I have no idea why it affected one and not the other as well. It struck me odd. I had done the rescan as and it finally reconnected. Had to delete the MT4 IOS app on my ipad and reinstall, but not on my iphone. Very strange indeed. The LINKS in post #2 are about 5 months out-of-date. I’m working on fixing that. 80 new links have been added to post #2. it is now up-to-date. transition to MT5 which is finally beginning to happen. that all new Evolve.Market accounts are MT5 as well. “hope springs eternal !” and we’d like to see that change !!! bringing them more into line with the rest of the world. by the offshore brokers ?? From HyperScalper:Perhaps there will come a time when we U.S. persons will again be welcomed by the offshore brokers ?? On 1st August 2018, the new ESMA investor protection measures come into force for retail clients. We are writing to inform you of the changes we need to make to your account. In preparation for the 1st August deadline, on 28th July 2018 new margin rates will be applied to your account. This means that all trades opened from midnight BST on 28th July 2018 will be subject to the new margin rates. If you have existing open positions prior to midnight 28th July 2018, these will remain on the current margin levels until you close them. They will not be subject to the new margin requirements. From midnight BST on 28th July 2018, no negative balance protection will also be applied to your account. This means that the balance on your account cannot go below zero. Please also note, the 50% margin close out rule will continue to be applied to your account, unless we have communicated to you otherwise. We will be in touch in the next couple of weeks to tell you more about how these changes will affect you. Professional Clients will not be affected by the new upcoming ESMA regulations. Find out more about becoming a Professional Client. If you have any questions regarding the information in this email then please do not hesitate to contact us on the numbers below." If you read the above post, well… if the restrictions kick in, then there are less and less differences between the US brokerages and the other ones so maybe US traders can then trade elsewhere. Making difference clearly between retail traders and “professionals” - whatever the later means. The ridiculous leverage, which is lot for than in the US. For example look at Cryptos. The new leverage is 2:1. Is that serious? I am sorry, it seems like I made above the changes of the table showing the Retail Margin, New Margin and Change, but it somehow wasn´t saved the way I made it so it is a bit difficult to interpret the numbers there. Here is what I got from one of my “regulated” broker. Pursuant to your recent discussion with us, and based on information you have provided on your application form and/or other information available to us, we shall treat you as an elective professional client (as defined by the Financial Conduct Authority (“FCA”) rules) in respect of all your investment business with us. We categorise you as a professional client on the basis that you meet the requirements for an elective professional client set out in the Appendix to this letter. In accordance with the title transfer financial collateral arrangement in CASS 7.11 of the FCA’s Client Money Rules, and in agreement with Term 18.3 of our Terms of Business you agree that any money (i) you transfer to us or (ii) have transferred to us, or (iii) which is transferred to us on your behalf by way of margin or otherwise will be treated as a transfer of full ownership of such money by you to us for the purpose of securing or covering your present, future, actual, contingent or prospective obligations. guarantee we would agree to it. I have a couple of comments and a question I hope you can help with. First and foremost this whole thread is AMAZING and Thanks to all who have put in the work to gather the broker info!!! Next, I am another whose account was moved from Tallinex to Capital City Markets. I went through the issues with credit card deposit supposedly not being recognized by CCMs bank. My credit card issuer honored my fraud claim and I'm not sure what ever happened past that. I hope others affected by that were refunded. As if that wasn't bad enough for CCM, I read posts in this thread of someone waiting a ridiculous amount of time for a withdrawal. Well I put in my first withdrawal request on Monday and I will update you as the process moves along (fingers crossed it goes smoothly). My question is this, I have been growing a small account and have now reached the point where the FBAR is a consideration. It appears many of you here are dealing with this. I understand how to file and the form appears easy enough, my concern is does filing the FBAR create any headaches for you? Further scrutiny? Increase the odds of an audit? Are there any consequences that come from filing this report? I pay my taxes, I'm not trying to cheat. But I prefer to live my life under the radar and want to know what the FBAR exposes me to. I welcome your experiences and opinions on this. Thanks again for all the work in this thread. Which broker can use in Belgium? This thread is directed to U.S. traders looking for trustworthy brokers outside the U.S.
We call them offshore brokers. We don’t address the needs of traders in other countries (except, occasionally, Canada) who are looking for brokers beyond their own national borders. Now that ESMA has stepped up to challenge our own CFTC as the World Forex Police, it will probably become necessary for someone from Europe to open a thread similar to this one, in which to address the interests of European traders desiring to escape from ESMA. Back to your question – I’m no authority on brokers who welcome traders in Belgium. Please note that I am not recommending any of the brokers on that list. I am simply suggesting the list as a starting point for performing your due diligence. Okay! Thank you soo much!! Don’t worry about ladders, black cats, or broken mirrors. – Just watch out for the CFTC. Oh, wait, that’s not just on Friday the 13th. – That’s every day! 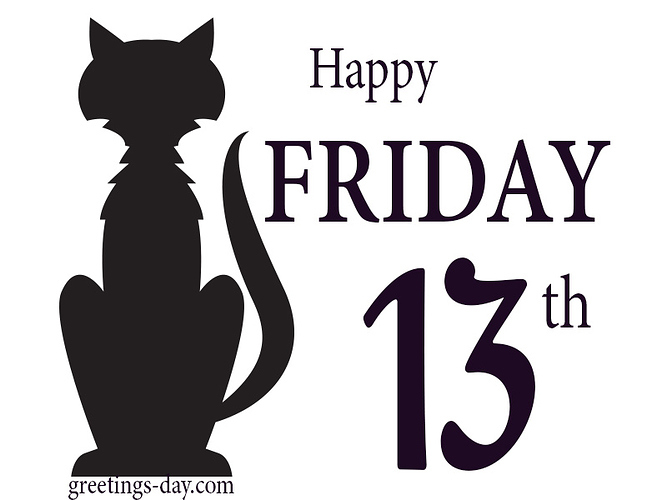 Anyway, guys, have a Happy Friday the 13th.